I am a professor in artificial intelligence at School of Science (Computer Science and Software Engineering), RMIT University, Melbourne, Australia. I received my Ph.D. degree in artificial intelligence from University of Otago, Dunedin, New Zealand. My research interests include machine learning, evolutionary computation, complex systems, multiobjective optimization, multimodal optimization (niching), swarm intelligence, data mining/analytics, journey planning, math-heuristic methods for optimization. I am an Associate Editor of IEEE Transactions on Evolutionary Computation, the journal of Swarm Intelligence, and International Journal of Swarm Intelligence Research. I am the group leader of ECML (Evolutionary Computation and Machine Learning) research group. Here it is my CV. Citation Stats: Google Scholar; ORCID; Scopus. 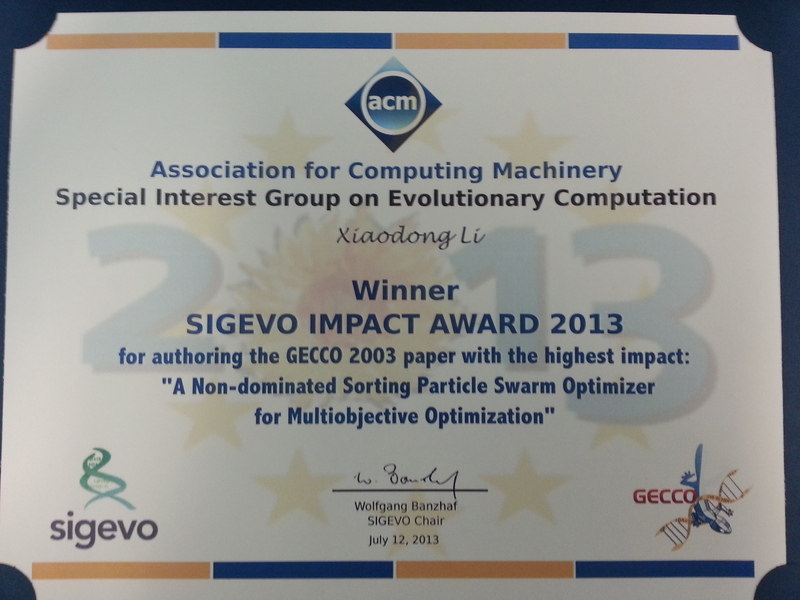 Recipient of 2013 ACM SIGEVO Impact Award. A list of past recipients. Awarded 2017 IEEE CIS "IEEE Transactions on Evolutionary Computation Outstanding Paper Award". Awarded "Pengcheng Scholar" (Adjunct Professor), Southern University of Science and Technology of China (SUSTC), 2017 - 2018. ARC Discovery Grant (DP190101271), "A novel and efficient approach for optimisation involving iterative solvers”, $360K, 2019 - 2021. ARC Discovery Grant (DP180101170), "Hybrid methods with decomposition for large scale optimization", $352K, 2018 - 2020. ARC Discovery Grant (DP120102205), "Novel decomposition methods for large scale optimization", $317K, 2012 - 2014. ARC Linkage Grant (LP120200305), "An integrated and real-time passenger travel and public transport service information system", $510K, 2012 - 2015. ARC Linkage Grant (LP130100743), "Enhancing the Australian theme park experience by harnessing virtual-physical play", $300K, 2013 - 2016. ARC Linkage Grant (LP130100236), "Developing an integrated optimisation platform for innovative design of composite fabrication process", $205K, 2013 - 2016.